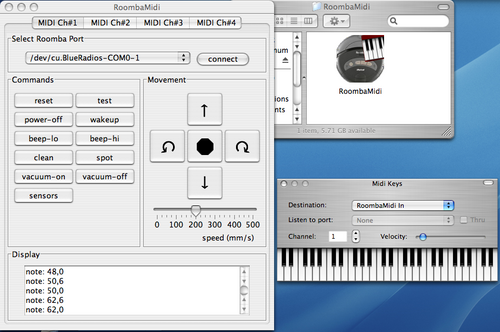 If you want your roomba to play pre-made midi google MIGHTY MIDI you just download a midi file then select it, then input set as roombamidi and your good to go! Not really. You can make simple beeps as shown above, but you can’t make the sliding tones, squirts, and grunts that R2D2 does. You idea of approximating R2D2 noises with MIDI beeps is intriguing. I bet you could get kind of close doing it that way, but it still would have the discrete-ness to it of the notes. It crashes when I try to open it! 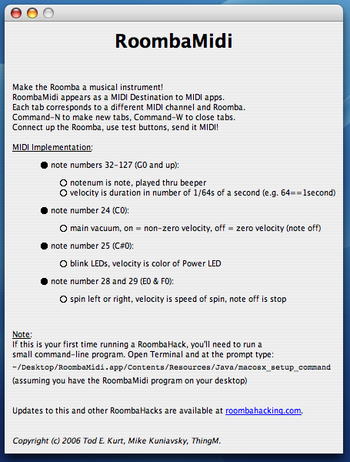 You should create a RoombaMidi where you have the GUI but you can also send your own commands (Via text) inside the application to the roomba!